The moiré patterns alone would be incredibly distracting. So I eliminated that possibility immediately. The eye would be immediately drawn to the seams, and it would ruin the airy effect of the mesh. So I came back to my original thought, which was to use the charmeuse as an underlining. 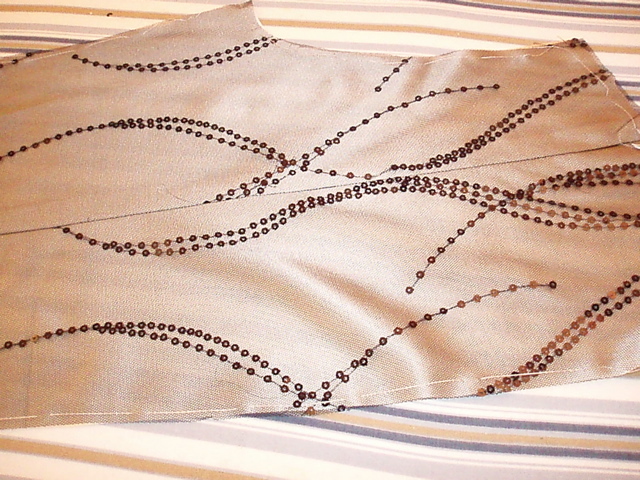 Between cutting this fabric and underlining it to the stretch charmeuse, I took several days to get ready to sew. It was worth it. I would like to say, that if you are going to underline a fabric like this, do it by hand. Notice my underlined piece. This is the left back. 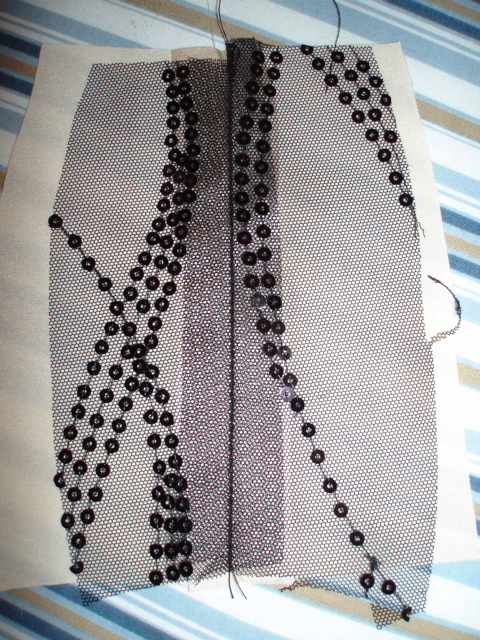 The basting stitches are very long, and there is no puckering. Had I done this by machine, I can guarantee that there would be puckering and grain shift going on, with unpleasant, or perhaps even disastrous results. I used a plain cotton basting thread, and I used 1 1/2 inch long running stitches in the seam allowance, about 1/4 inch away from the cut edges. This gave me the control that I needed to keep the fabrics together properly during stitching. And here’s what the seam looks like from the right side. The seam is much less conspicuous, and the allowances are all well hidden. Underlining is a couture technique that is well worth the effort. When it’s finished, this dress will be quite spectacular, and it won’t have any of the seamline distractions that might be there otherwise. Watch this space for the finished dress. Last month I won a book on ebay called “Sewing for men and boys”. 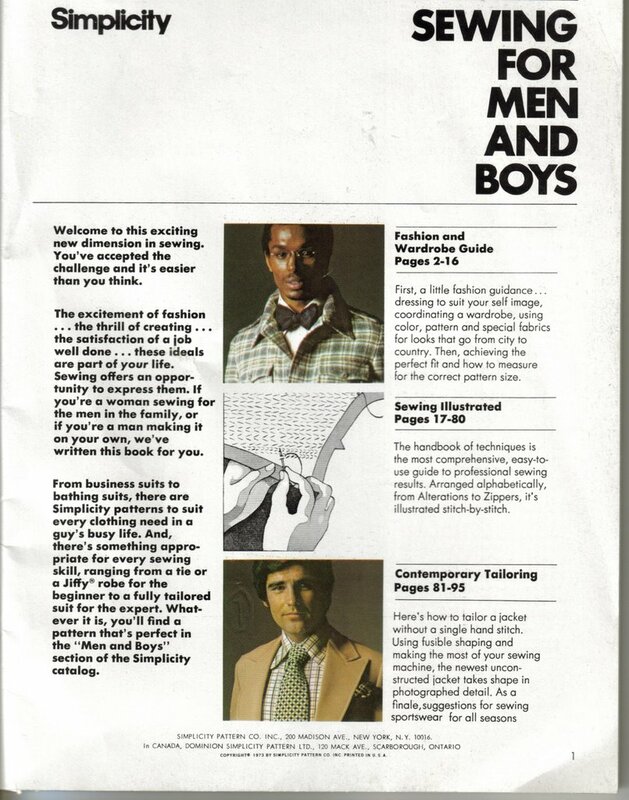 I had no idea what the book was about, besides sewing men clothes but the title sounded interesting enough to buy it. I received the book today, it is a soft cover with 97 pages published in 1973 by Simplicity. 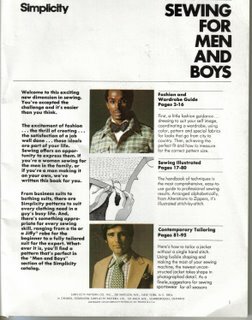 I was very pleased to see that a lot of tailoring sewing techniques I learned from a Dutch tailor are clearly described with a lot of pictures/ diagrams. This is the first time I noticed that real tailoring techniques are available for the home sewer. I have other tailoring books but this one is very well written and does have great accompanied pictures so you can see what to do. Also pressing techniques and the specific pressing tools are described very well. 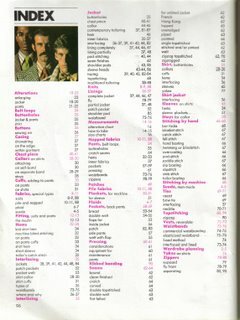 The sewing and tailoring information can also be used for sewing for woman like jackets and coats. 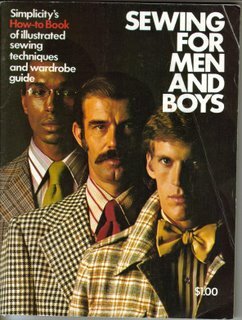 This book is OOP ( out of print) but worthwhile to search for if you want to learn more about tailoring techniques. It’s a funny thing about sewing and me – when I get outside my zone, even though I have years of sewing experience, I still feel that newbie anxiety. This is the first project I’ve ever done in leather, and I can’t thank Diva Els and Diva Ann enough for their wonderful recent posts on making leather bags. The La Rue bag is perfect as a first leather project – it’s simple (only 2 sides) and it presents a LOT of embellishment opportunities. This is made from dark bittersweet chocolate lambskin and it has a silver silk dupioni lining. Dark brown and silver is one of my favorite color combinations – think of the wrapper on a Hershey Bar. The leather came from an EBay merchant named Leatherwise and it was really easy to sew. Of course, you need a Teflon foot and a leather needle. I used Magna-Tac to glue the seams, and the hardware is all nickel plated. Truthfully, I lucked out with the hardware – I found the chain and the rings at Windsor Button in Boston, and the chain on the tassel is a tiny piece left over from my Chanel jacket. Years ago my mother gave me some vintage nickel grommets so I was all set there. 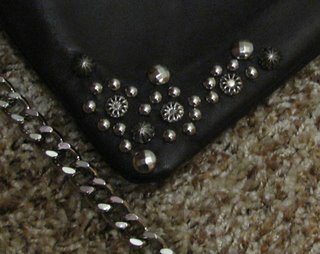 I think matching the hardware on a bag is the biggest challenge, and Els’ recent post of canibalizing old handbag hardware is a brilliant idea. The idea for the strap came from a Gucci bag owned by my friend Stina. 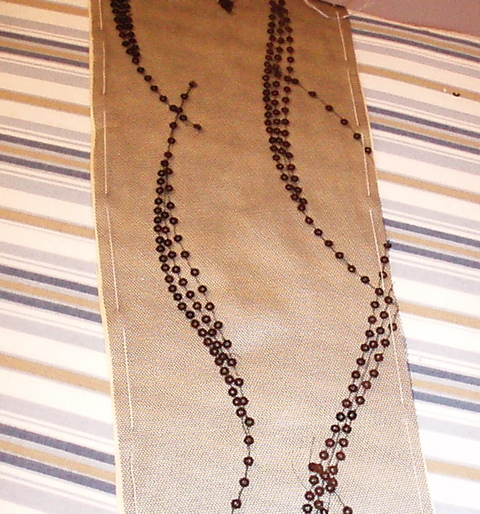 Originally I wanted to do two pieces of chain parallel, but it was too heavy even though it looked amazing. I’ll have to size up this bag into a true tote and give that a try. The studs came from Mister Nailhead, also on Ebay, and do check them out because they have a super “Buy It Now” deal that gets you 500 pieces of really cool mixed studs. I haven’t used every style they sent me – there were 10 total in the bag, both nickel and brass. Did do a few pattern and construction changes: replaced the binding with a simple curved facing, a horizontal center seam was added to the lining to enable me to edge stitch all the way around the top edges, and instead of the zipper pocket I just did a very simple open cell phone & pen pocket. The armhole was widened 1/2 inch, which is enough for me. 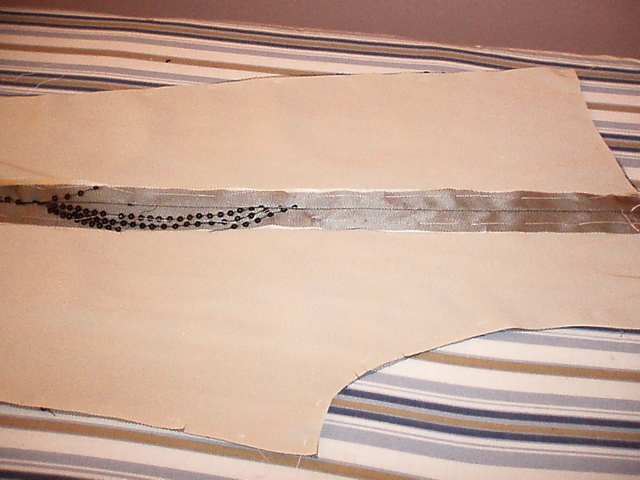 I cut an L-shaped slash into the pattern down the middle of the armhole and slide the piece to the left 1/2 inch. Then I added a gentle curve to soften the right angle, which actually made it look more like the original Patricia Field bag. The tassel is embellished with hot fix Swarovski crystals in mixed colors of red, and a 20MM green faceted crystal bead forms a tassel head. The crystals were hot fixed onto a flat piece of leather which was wrapped around neck because it was impossble to hot fix the crystals onto the curved tassel neck. 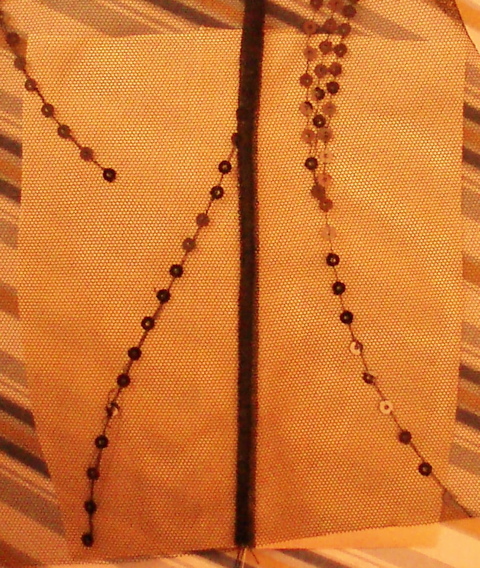 The tassel is attached to the chain with looped wire which runs through the center of the bead and tassel neck to a stop bead hidden in the skirt. I do need to get heavier beading wire and add a crimp bead to make it really secure. 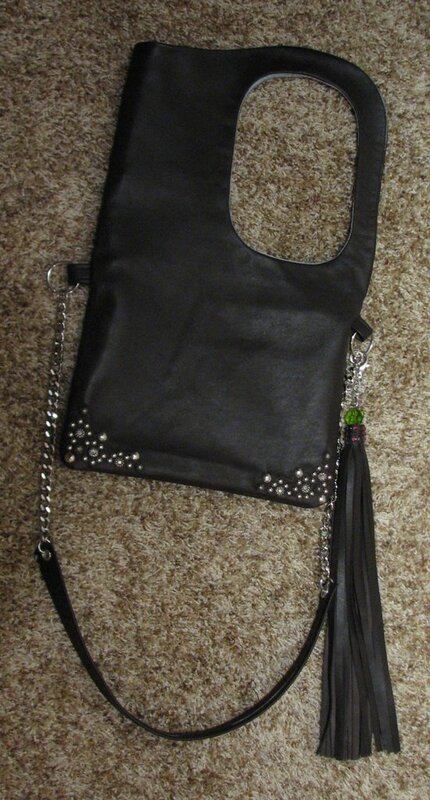 The tassel attaches to the bag with a big nickel plated lobster claw clasp so I can remove it. So a big thank you to HotPatterns for such a great bag! La Rue bags are now going for the ridiculous price of $150 on the Patricia Field web site, so get sewing and make one of your own! I really love this pattern. While doing some research on my next industrial machine purchase, I came across a fascinating feature on the Juki website. It’s more fun than Word Whomp on Pogo.com. This site lets you see what Juki products are recommended to make sewn goods. Do you want to make jeans? 14 different models of machines. How about a bra? That only takes 6 different models. It gives one a real appreciation for the capital outlay that sewn product manufacturers make. And it’s a lot of fun for machine junkies, too. Oh, and one more added benefit is that it gives you an overview of the steps taken to make a garment. 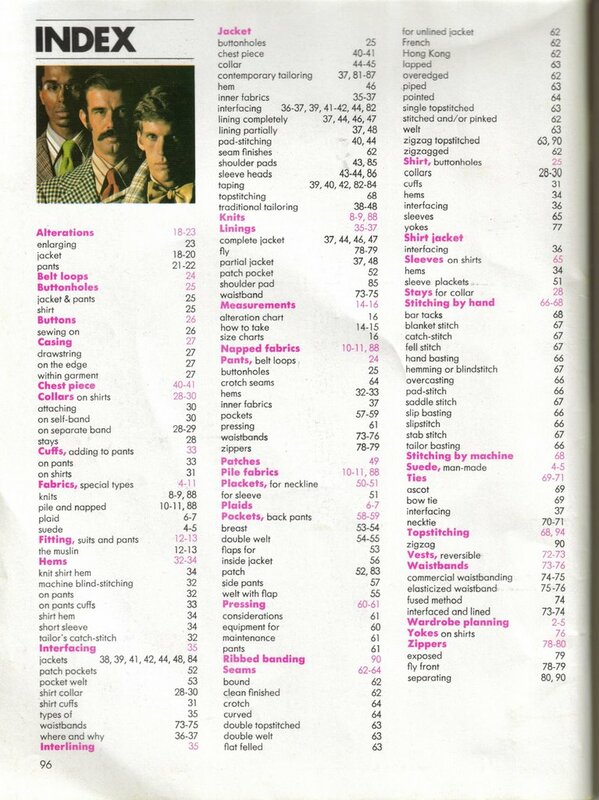 Just click on the picture of the garment type to see what machines are used. Since I made my last leather bag I felt the urge to sew another one for everyday use. I save my bags although they are be worn out or out of date but I cannot throw a bag away. One of my favourite bags ((bought 10 years ago) was worn out but I still like the design and the hardware was good enough to reuse again. So I made a copy of this bag. A piece of dark green butter soft leather was in my stash and waiting for a use. I measured the bag width, length, height, and depth and made a paper pattern. The original bag has a center seam at the side where the zipper pocket is placed but I had enough leather to skip that seam. I interfaced the leather parts with a fusible non-woven special leather interfacing which can be ironed with a warm iron. The non-woven interfacing is cut with seam allowances. The bottom and side part could use a bit more strength so I added an extra layer of a sturdier interfacing between the first and second layer (this one without seam allowances). The shoulder straps also could use a bit more strength so I did some testing and used a piece of petersham ribbon as an extra layer. The opening of the bag where the zipper will be attached is stabilized with fusible seam tape as well as the lining opening. and on the other side a zippered one. The lining is interfaced with a fusible cotton red interfacing. The inside pocket is made of a double layer of the lining fabric. This pocket is sewn at the lining by topstitching around the edges. I also added a key ring at the side depth of the bag. When I was sewing the short end of the zipper at the bag with the hardware ring attached, I noticed I made a mistake. The hardware has a silver colour and I used a matching green with brass colour zipper teeth. but the colour was not spot on and the zipper was not working properly. It was stiff. I tried to smooth it by rubbing beewax on the teeth but it did not help. So I decided to use another zipper from my stash. This time a grey one that worked okay but needed to be covered to hide the grey tape. I used 2 strips of leather to cover the tape. I stretched the leather a bit while sewing the leather at the zipper tape so the zipper has the same shallow shape, to match the bag’s shape. So the zipper is sewn in on a different way. The original bag zipper opening is topstitched and the zipper tape was partly visible. It was easy to sew this bag on my Pfaff sewing machine because the leather was soft, the hardest part was sewing in the zipper. I needed to do some tests for the zipper to see which order to sew it. I found out that the short side of the zipper, where the ring is attached, needed to be sewn in first. Secondly, the zipper long ends on both sides, and lastly the other short end where the shoulder straps is attached. because I had already glued the leather seam allowance to the inside. which helps to prevent the shoulder strap gliding of my shoulder. Done and ready to use.